It’s more important than ever for nonprofits to be at the table for informed, thoughtful discourse about Maine’s future. 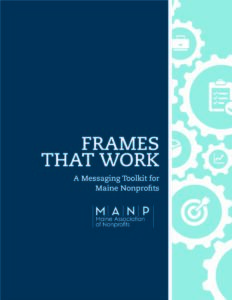 The Frames That Work toolkit is designed to help Maine nonprofits improve public and policymaker understanding of the key role that nonprofits play in Maine’s economy and quality of life. The tools will help nonprofits frame messages about their organizations within the broader context of the sector’s value and impact. In addition, MANP has a free, recorded webinar that outlines key messages and strategies nonprofit staff and volunteers can use spread the news about how nonprofits are critical to making Maine a great place to live, work, and visit. Together we can can ensure that civic dialogue about Maine’s most pressing issues reflects the vital role that nonprofits play in our state. Complete this form to download your free toolkit. This toolkit was made possible by generous support from Maine Community Foundation and The Bingham Program.